First, if the revenue management forecast model predicts an airline flight will be full, analysts should be cautious in overriding the model. Revenue management experts agree that, too often an airline analyst will improperly override a model, reducing the selling fare unnecessarily or opening up inventory to lower fares. Airlines in strong competitive positions can dilute their revenue significantly by unnecessarily chasing the lowest fare. Of course, significantly lower fares may not just drive share shift but also can also drive an expansion of the market overall. The revenue management forecast model based on history could underestimate the size of the market given a lower fare. Some low fare carriers boast that their low fares have little impact on incumbents since they are effectively attracting new demand not in the base. In many cases, an airline could be better off by not matching the low fare – designed to bring new customers into the market – but instead explicitly reserving inventory for higher fare passengers who now find they can’t get on the carrier that filled up on the ‘stealth” fares. Price elasticity varies by competitor by market. Ultra-low cost carriers for example, are often viewed as an inferior product by legacy carriers and price elasticity is relatively low – fares must be significantly lower for these carriers to impact legacy airline demand. In these cases, a $5 - $10 decline in their fares may not be expected to drive a change in demand. On the other hand, the price elasticity among similar legacy carriers could be quite high; even a $1 difference could shift demand. 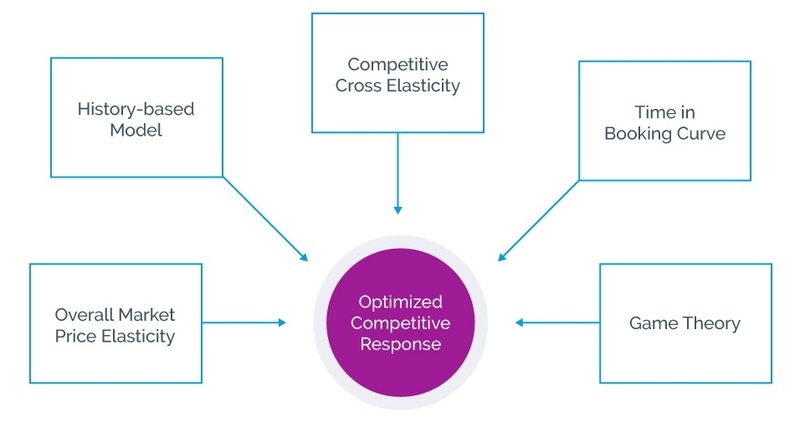 In each scenario, the elasticity varies dramatically by competitive position in each market. The dominant carrier in a market is more likely to be a price leader while a relatively small carrier – ULCC or legacy – will not be able to change demand as significantly by a price change. Of course, the above is based on tactical, mathematically-derived optimums. Game theory, however, may override this tactical approach. Matching a competitor – or even undercutting his fare – even when it isn’t revenue optimum, makes sense as a strategic action when the purpose is to drive a certain industry result, not a firm-specific result. For example, aggressive matching may cause the competitor to change his inclination to undercut prices in the future. Matching a new entrant’s introductory fares can set the stage for competing thereafter and can also signal to customers that the incumbent intends to continue to meet all market needs. Similarly, not matching may indicate to both customers and competitors that the low fares are associated with an inferior product or that they may be unsustainable. My standard approach was to match any low fares filed by key competitors but to vary inventory availability by market based on the revenue management forecast model. Effectively, the low fares were not available close-in or in markets that did not need them. This standard approach, however, had to be modified when the revenue management forecast itself was called into question. And this approach was ineffective in a game theory scenario, given that frequently the competitor was allowed to keep its fare advantage. Calculation of elasticity by competitor by market and by days-before-departure can help assess the vulnerability of the forecast – when cross-elasticity is very high, the forecast is more in doubt and merits another look for potential overrides. Using these five factors, airlines can develop analytically-based business rules for dynamic matching. In general, system-wide policies will not drive optimum results. Explore how to optimize your pricing strategy at each phase of the travel purchase funnel.